Transform your favorite mug into an adorable soy wax candle, learn about scent theory, and have fun with Milton and Margie's Soy Wax Candles! 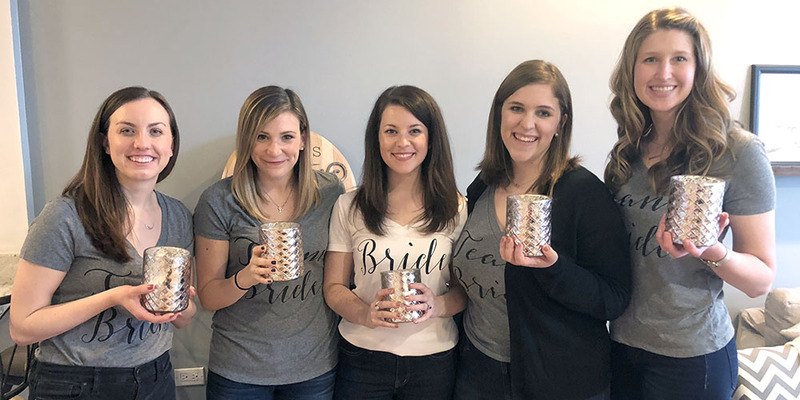 We offer fun private candle-making classes and parties for everything from bachelorette parties to corporate events. We'll come to your home or find you the perfect venue. Chicago candle-maker Jessica Snively, creator of Milton and Margie’s Soy Wax Candles, teaches you how to make soy candles from start to finish. Throughout the process, you’ll create your own signature fragrance from a blend of scented soy-based oils. We'll supply a bunch of eclectic oils with options from floral (e.g., Lavender and Juniper) to natural (e.g., Cedar and Eucalyptus) and sweet (e.g., Buttercream and Fudge Brownie) to rugged (e.g., Leather). All the supplies are provided, including wax and fragrance oils. You can have your guests bring their own containers or request containers for an added fee of $2 per container. Each participant gets 1 lb. of wax, and depending on the size of your container(s), each guest will leave with 1–2 completed candles. Classes for up to 8 participants last approximately 2 hours. I can travel to any venue—including private homes and office spaces—in the Chicagoland area. A location with a stove onsite is preferable, but I can arrange to bring hot plates to spaces without a stove. If you do not have a chosen venue in mind, we can work together to find the perfect space. For a standard, 2-hour class for 4 people or more, I charge $40 per person. For a standard, 2-hour class for 3 people or fewer, I charge $45 per person. To set up an event, click the Book My Event button above. Please book at least 7 days in advance. Thank you for your interest! Email Jess at info@miltonandmargies.com if you have any questions. Learn to make soy candles at home! Our soy candle-making kits include instructions, 5 lbs. or 10 lbs. of soy wax, fragrance oils, and everything you need to make your own soy candles.